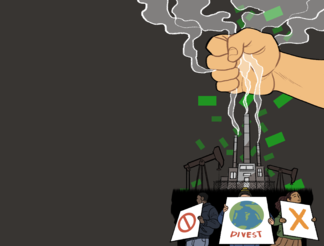 Why divest from fossil fuels? For most students at the University of Waterloo’s Faculty of Environment that question answered itself. When a group of us with Fossil Free UW campaigned to divest the student-funded endowment (known as WESEF), the most common response from our fellow students was basically “wait, why are we invested in burning up the planet?” That’s why in November of 2015 at the WESEF annual general meeting students voted unanimously to recommend to the university that our endowment be divested from fossil fuels. Now, since students can only recommend how our money is managed, it is up to the university board of governors to decide. The ball is in their court when they meet February 2nd. How will they respond? In the past many universities shrugged off divestment. In 2013 Harvard rejected divestment because their endowment has nothing to do with driving climate destruction. That response is still certainly available. And financial markets do still value fossil fuel reserves as if they will all be burnable. On the other hand, since 2013 many universities large and small have committed to divestment, including global innovation leaders like Stanford. So has the world’s largest insurance company, Allianz. Coal and oil stocks are way down. And financial heavy weights like Mark Carney are warning of a financial carbon bubble. In all, $3.4trillion in assets have pledged to some form of divestment. So now, divestment can’t be said to impractical or to violate fiduciary duty. The growing tide of divestment actually suggests the opposite – that not divesting is inconsistent with fiduciary duty, especially in the longer term. That’s because of the small detail that a healthy investment portfolio needs a functional global economy, which in turn, needs a livable climate. After the Paris climate summit, most people know that means staying below 2C warming, and that means leaving most fossil fuel unburned. So, it flies in the face of the global plan to avert disaster to invest in companies whose business models are fundamentally based on the idea that all reserves are burnable. Investing in fossil fuels may result in short term losses, or in gains, but in the end signing up to their business plan is a grim suicide pact. If it’s profitable in the short term, we all end up going down with the ship. Still, the most likely path of the University of Waterloo is to keep its head down, keep to its narrowly defined obligations and reject any responsibility for profiting from climate destruction. Why? I think the classic Pete Seeger song “Who Killed Davey Moore” explains it best. That is why it is up to students and those who support our call for divestment to insist that the University of Waterloo look up at this urgent moment, embrace its responsibility for a safe climate, and seize the opportunity to bet on clean energy innovation.